Livermore Dam, on the Androscoggin River in Livermore Falls, Maine. Livermore Falls, located 30 miles northwest of Augusta, is a small town of approximately 3,000 people. When the Abenaki tribe originally settled the area, they called it Rockemeka, or “great corn place.” In 1771, the General Court of Massachusetts granted the land to war veterans, with English settlers first arriving in 1795. During the early 19th century, Livermore Falls became known for its sawmills, logging operations, gristmills, paper mills, and shoe factories. Visitors to Livermore Falls and the nearby cities of Livermore and Jay come for its relaxing atmosphere and natural beauty. Livermore Falls is home to Maine’s Paper and Heritage Museum, capturing a unique period of western Maine’s history. Founded in 2002, the museum chronicles the rise and fall of paper-making towns and paper mills along the Androscoggin River. Local residents and former mill workers provided oral histories, while historical documents and photos illustrate what life was like during the region’s paper-making heyday. Each year, Livermore Falls celebrates an annual Apple Pumpkin Festival. This celebration commemorates the harvest time and highlights the area’s cultural and agricultural heritage. Browse local arts and crafts, sample fresh produce, listen to live music, or eat traditional Maine foods at this festival, held on the last Saturday of September. 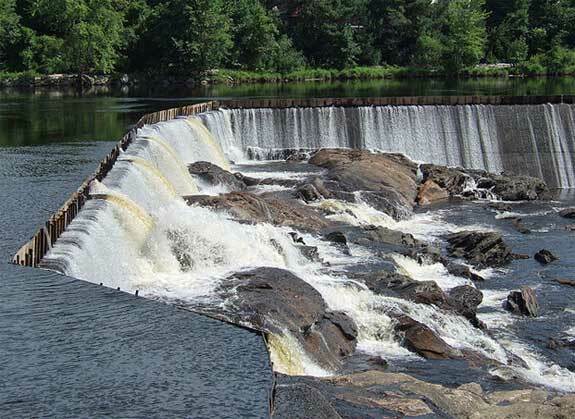 Livermore Falls is located on the Androscoggin River, which stretches 170 miles from Lake Umbagog on the New Hampshire border to the Kennebec River in Merrymeeting Bay. Although the Androscoggin was once one of the most polluted rivers in the United States and the inspiration for the Clean Water Act, it is now a clean, clear river with excellent recreational opportunities. The Androscoggin is popular among canoeists with its spectacular scenery and serene paddling opportunities. Anglers also fish for brook trout, which have been restored to the river. Lodging and dining options in Livermore Falls are limited. There are no major hotels, motels, or inns, although several vacation rentals are available in the area. Dining options are limited to cafes, pubs, and casual eateries. Livermore, a town of approximately 1,000 people, is located just south of Livermore Falls. One of the town’s primary attractions is the Washburn Norlands Living History Center. In the 19th century, the Washburns were one of the most powerful families in New England. Israel and Martha Washburn’s children became governors, congressmen, Secretary of State, United States senators, foreign ministers, and Civil War generals. Their descendents also founded the Washburn-Crosby Gold Medal Flour Company, became railroad presidents, and invented the typewriter. The Living History Center features a museum, working farmstead, mansion, library, old school house, carriage house, and meeting house. Call 207-897-4366 for more information. The greater Livermore area has several opportunities for water-related activities. Visit Brettuns Pond, Lake Anasagunticook, Bear Pond, Long Pond, or Round Pond to go boating, canoeing, or fishing. Jay, which includes the village of Chisholm, is slightly larger than Livermore and Livermore Falls, with approximately 5,000 residents. Visit the Jay Historical Society at the old Holmes-Crafts Homestead. This historic Federal Style home was built in the 1820s and contains displays of old tools, antique furnishings, and granite-related items. Each year, Jay holds an Independence Day celebration. Typically, the day of festivities concludes with a fireworks show over the Androscoggin River. The towns of Livermore, Livermore Falls, and Jay combine forces to host this event. North Jay White Granite Park celebrates the granite industry, a large employer of Jay community members in the early 20th century. Jay’s fine white granite was in high demand throughout the United States. Today, visitors can walk through a beautiful orchard, explore a granite quarry, and eat at one of several picnic areas. Pine Island Park provides a peaceful oasis in the middle of the Androscoggin River. Although International Paper Company owns and maintains the park, it is available for public use throughout the year. Hike one of several short trails for beautiful views of the river or use the public boat launch for a boating excursion. Ski bunnies will enjoy the Spruce Mountain Ski Slope in Maine. Located on a mountain on the banks of the Androscoggin River, this volunteer-run organization offers competitive prices compared to many ski resorts. Ski one of 11 trails for quality family fun throughout the winter months. There are few accommodations options in Jay, although the surrounding towns have motels, bed-and-breakfasts, and family-run inns. Consider a rustic experience at the local campground after seeing the sights this rural community has to offer. Dining options include pizzerias, cafes, diners, and other casual restaurants. Visit the following directories to find lodging, dining, attractions, shops, services and recreational activities in the Livermore, Maine area.